Hence, the theme in this version of the black widow tale is of crime and murder, with a bevy of evil beauties jostling for space on the reels with the unfortunate male victims who fall prey to the black widow murderess who preys on wealthy middle-class man and takes everything they have - including their lives. On the reels there are some generic 10-through-Ace icons, while a vial of poison, the three protagonists and a spider's web fill out the spaces. 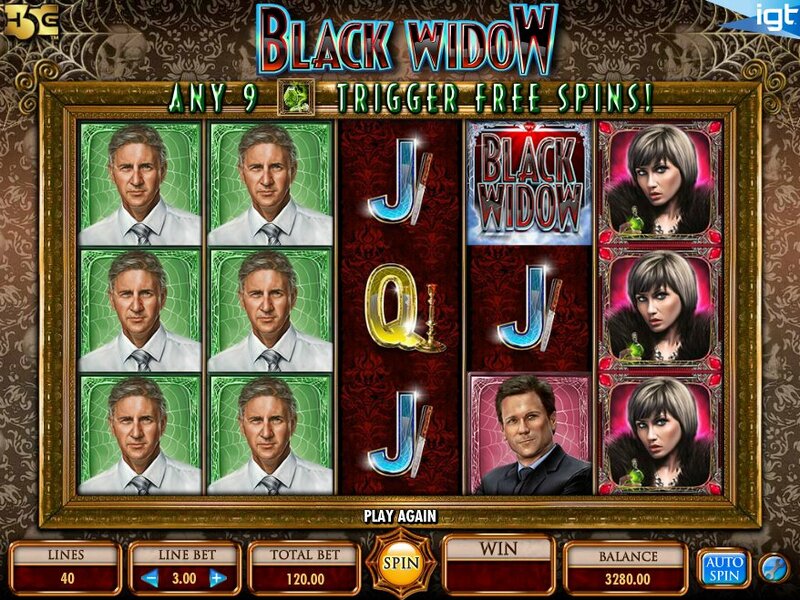 The Black Widow game logo acts as the game's Wild and five of those across the reels awards a 1,000x-line bet jackpot. It substitutes for all regular symbols other than the Scatters. The vial of green poison is the Scatter and will activate the free spins round if you hit it on reels 2, 3 and 4 where you can earn at least 7 free spins. But before each spin, one of the game's icons is randomly chosen and then appears stacked on the reels. During the free spins round if you trap one of the characters in the middle spot (i.e. the center spot on reel 3) you will earn yourself a multiplier on your win. Hitting the murderess black widow will result in combined multipliers and subsequently, bigger wins. With 40 fixed pay-lines and a fairly tricky bonus game to trigger, this is definitely on the higher variance side of slots. The RTP isn't too clever, either, but let’s not detract from what is a great theme and style. A preferred alternative is Immortal Romance, Microgaming's cracking gothic-themed slot that comes packed with bonus features. Elsewhere, if you're after more conventional romantic thrills, check out the Valentine-themed Starlight Kiss, also from Microgaming.